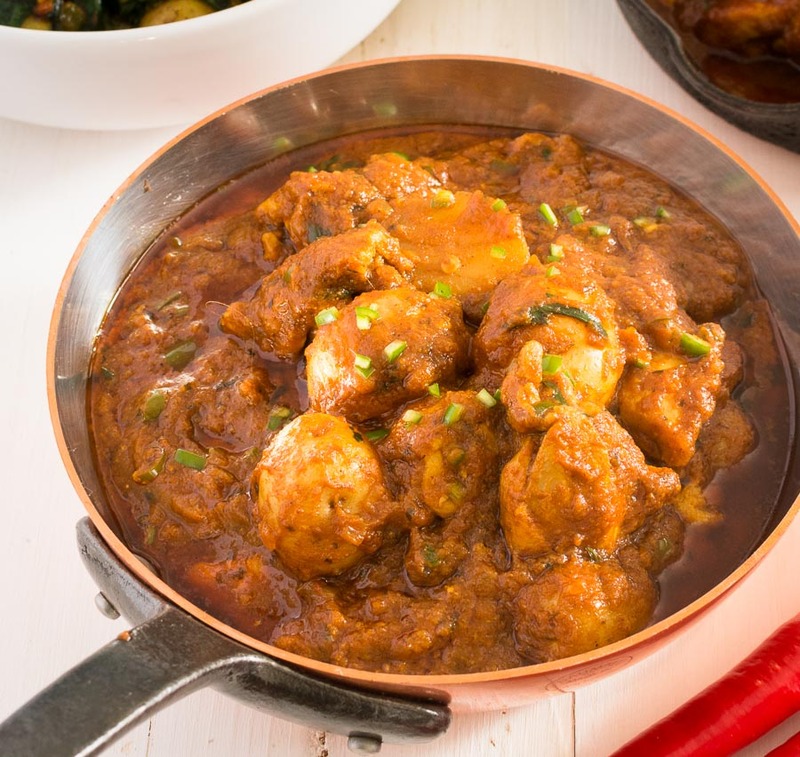 Aloo chaat chicken curry is one of the tastiest Indian curries you have never heard of. Restaurant style aloo chaat chicken curry doesn’t exist on a menu anywhere that I’m aware of. I made it up. It’s different from the run-of-the-mill curries you see on almost every Indian restaurant menu. The chaat masala powder really gives it a distinctive tang. It’s become one of my favourites. I hope it does the same for you. Aloo chaat is Indian street food. Fried potatoes are tossed in a mix of spices, green chilies and maybe some lemon or lime juice. 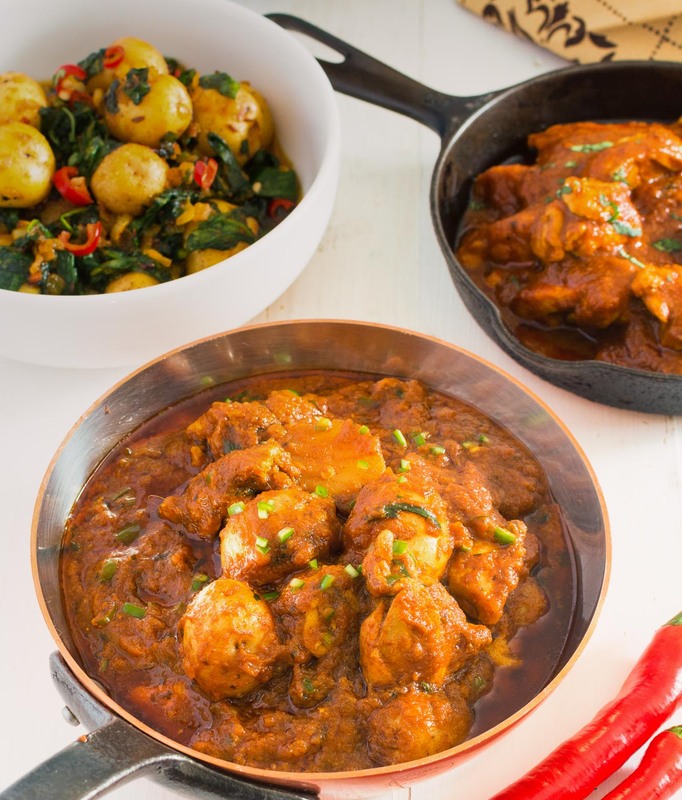 This curry picks up on those flavours but turns the dish into a saucy dish. The key flavour comes from the chaat masala. Without it, restaurant style aloo chaat chicken curry is just another curry with potatoes and chicken. With it, it’s something special. The key ingredient – the one that really makes it – is black salt. That’s where the tang comes from. It’s important. Some chaat masalas have it. Some don’t. Read the ingredients and make sure the one you get has it. If you can’t find a chaat masala that has black salt you can just buy some at your Indian grocer. It’s called kala namak in Hindi. Just ask for it. It’s cheap. Just add a pinch of it in when you add your chaat masala. Easy. It’s a pretty straightforward and follows the Indian restaurant technique exactly. Do yourself a favour and read that post first. There are pictures to help you understand. A video even. Prep your ingredients. Make your curry base. Have some heated and ready to go. Pre-cook your meat. Measure out your ingredients. Put on some old clothes – the curry sputters. Make this aloo chaat chicken curry as written. Or make it with lamb. That works too. Makes a great vegetarian dish if you used chickpeas instead or just with with the potatoes alone. Restaurant style aloo chaat chicken curry. May not be the most common dish on restaurant menus but it should be. Dilute the tomato paste with enough water to get to the consistency of passata. Heat your frying pan (don't use non-stick) briefly over medium heat. Add the oil. Add the onions and stir constantly until the edges of the onions start to brown. This takes about a minute or two, depending how hot your pan is. Mix in the green chili and cook another 30 seconds or so. Next comes the garlic ginger paste. Add it into the pan and cook it, stirring constantly, until it stops sputtering. Turn down the heat and add the spice mix. This is the critical step. Stir it constantly for 30 seconds. If it starts to darken lift the pan off the heat. You want the spice mix to cook in the oil but not burn. Turn the heat up to medium high. This is important. The heat is what caramelizes the onion base and gives the curry it's Indian restaurant flavour. As you become more comfortable with this technique try pushing it. Add the diluted tomato paste and stir until bubbles form (the oil will likely separate). This takes around 30 seconds to one minute depending on the heat. Add 3 oz of curry base. Stir until bubbles form (little craters really), around 30 seconds. Think lively boil. Watch the edges of the pan. The curry can stick here. Sticking is OK. Just scrape it back into the base. Burning is bad. Now add 6 oz of curry base and stir briefly. Let it cook until the bubbles form again. This takes 1-2 minutes. Add the rest of the curry base and let cook until the bubbles form. Turn the heat down to low and add the chaat masala powder, pre-cooked chicken and potatoes. Let the curry simmer for about 5 minutes. If it gets too thick add a bit more curry base. Don't add water. Mix in the lemon juice and coriander leaves. Garnish with a bit of chopped fresh cilantro and serve. Indian restaurants pre-cook their meat so it's ready for service. This recipe assumes the same. To pre-cook chicken, simply simmer it with a bit of curry powder and salt in chicken stock for about 10-15 minutes - until it's barely cooked. To pre-cook lamb or beef, do the same but plan for 1 to 1/2 hours for lamb and 2 hours or more for beef. You are making stew meat so you are braising until tender. You will need to keep an eye on the level of the stock. For beef use beef stock. In indian, main course, meat, poultry. Bookmark the permalink. There is a link to the curry base recipe in both the description of the dish (the text) and the recipe itself. Can you not see the linked text in a different colour? I’m making the aloo chaat chicken masala curry.i have already made the curry base.how should I adjust the recipe to suit 6 servings?thanks for a great site Phil. You can’t just scale the recipe easily. The technique relies on your ability to really get the pan hot when the base is added. Maybe try a big pan. Scale the recipe up 50 percent and make two batches. Keep the first batch warm while you make the second. Or make 3 batches as written. 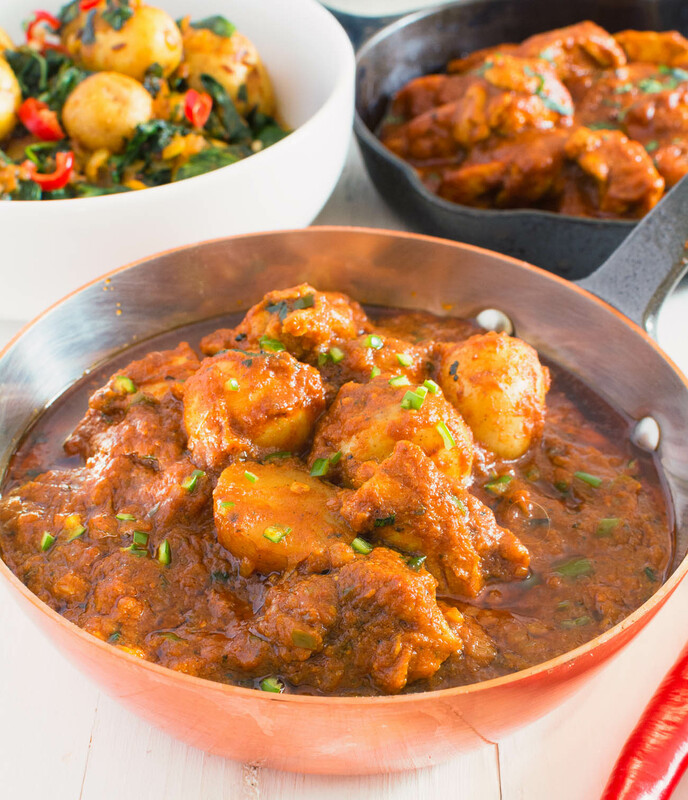 If you haven’t made a restaurant style curry before then making it for guests is pretty bold. Good luck.